What is the difference between Airwheel S6 and Airwheel S8? Abstract: Riders can keep balance by leaning forward and backward with the built in attitude control theory, software algorithm, and gyroscope systems. Up to now, there are seven different kinds of series in Airwheel, adding the newly released Airwheel C series, a sort of intelligent helmet. On the CeBIT 2016, Airwheel has brought Airwheel S8 with multi-pose controlling system. Airwheel self-balancing electric scooter is a cutting edged means for mobility transportation with technology adopted from the aerospace industry. Riders can keep balance by leaning forward and backward with the built in attitude control theory, software algorithm, and gyroscope systems. Up to now, there are seven different kinds of series in Airwheel, adding the newly released Airwheel C series, a sort of intelligent helmet. On the CeBIT 2016, Airwheel has brought Airwheel S8 with multi-pose controlling system. So, what is the difference between Airwheel S6 and Airwheel S8 saddle-equipped electric scooters? As known to all, the distinguishing feature on which S series is built is its ease of use, such as the Airwheel S3, S5, S6 and the latest S8. When the S6 sitting posture self-balancing scooter launched, it caused a sensation among the whole industry, as it is different from the former S series greatly, without controlling shaft and with a saddle. 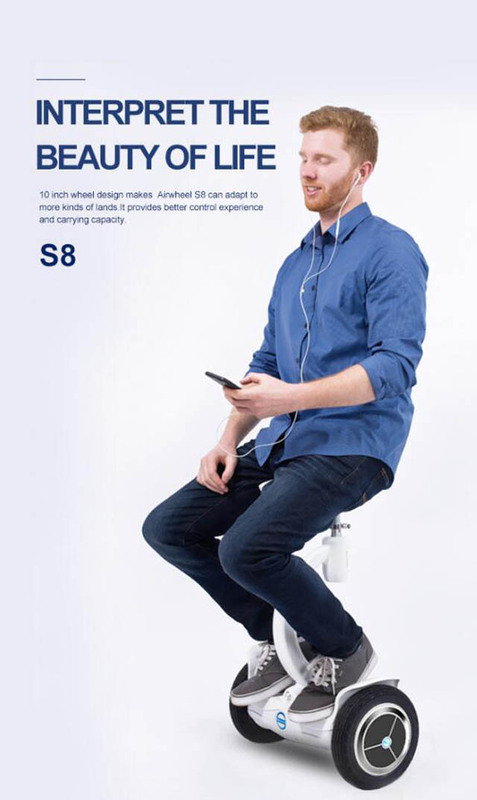 Both Airwheel S6 and S8 can be ridden in two different ways, either standing or sitting to manipulate it. While, Airwheel S6 mini electric scooter is a good interpretation of small is beautiful. This is especially true if we refer to its wheels: with a small diameter measuring just 8 inch, they allow for extremely precise movements, and all the sensitivity required to perform even the most complex manoeuvres in compact spaces. In order to have a better control experience in standing posture, and to have better load capacity, the seat's operating rod is designed in C shape. Previous：Airwheel latest intelligent helmet - C series is one of necessary protective gears for riding.